Fire services were called to the incident yesterday afternoon. 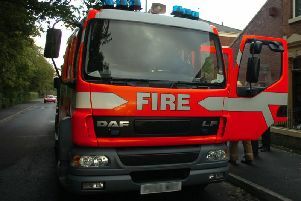 Fire services were called to a car dealership in Chorley after reports of a blaze and popping and banging noises coming from the rear of the property, say fire services. Three engines from Chorley and Horwich attended the fire at Vauxhall dealership, Wilson and Co, on Standish Street at around 4.30pm on 22 January. Firefighters forced entry into the building and used fire breathing apparatus and hose-reels to extinguish the blaze that started in the workshop. Witness, John Lilley, from Chorley said: " I was coming out of Asda when I saw smoke coming out of the rear of the dealership, I dialed 999 for police and fire. "There was a lot of popping and banging inside the garage." A spokesperson for Lancashire Fire and Rescue said: "We would like to remind the public to always unplug non-essential electrical items when not in use." The cause of the fire is under investigation but is not thought to be suspicious, say fire services. Pictures courtesy of John Lilley.